The Rojone ALN – series of interface leads are designed to allow connection of our range of headsets to just about any piece of communications equipment you can think of, from portable two-way radios to specialised communications systems. Each lead assembly consists of a Nexus TJS-102 (U-94A/U). This combination socket is a Military grade component (which mates with the TP – 120B or TP-102 used on our headsets), push to talk switch, and housing complete with a substantial belt or clothing clip. if your requirement extends beyond the list below – please ask! 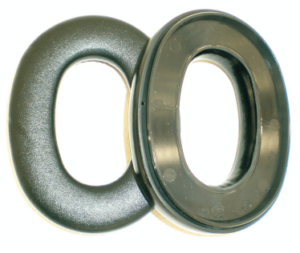 We can manufacture in Australia to your unique requirements. ALN – _xxx In the first space, insert the letter which represents the radio manufacture. ALN – x___ In the three remaining spaces, show the 3 main digits of the radio model. Consist of two (2) liquid & foam vinyl covered Ear Cushions. Includes instructions. 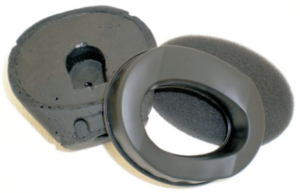 Foam & Cushion Kits consist of two (2) Ear Cushions & two (2) inner foam assemblies which support the speakers. Includes instructions. Foam Windsock suits all our headset models. 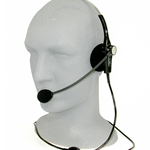 Field replaceable microphones to suit all HSP Series headset. 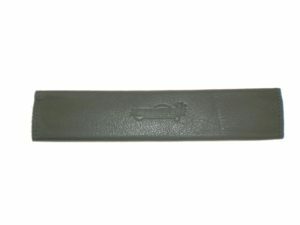 7432300147 Standard replacement Leather headband cover. Suits all our headset models. 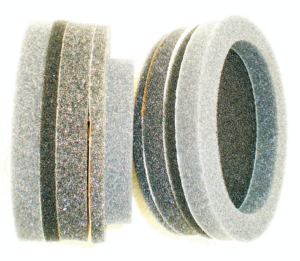 Mouth guard microphone foam cover kit consists of one (1) pad, one (1) foam cover & one (1) acoustic moulding inner. Includes instructions. 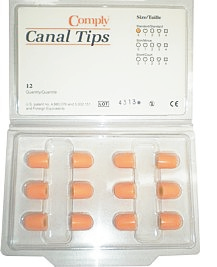 Comply Canal Tips (Pack of 12) Suits MK1 CEP's. 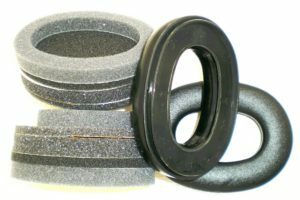 Hygiene kit consists of two (2) liquid & foam vinyl covered Ear Cushions. Includes instructions. 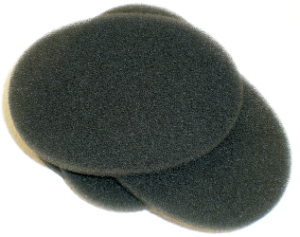 Cushion and foam kit consists of two (2) Ear Cushions & two (2) inner foam assemblies. 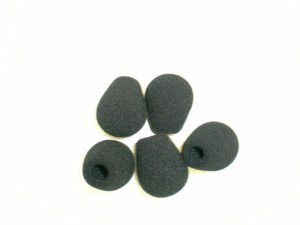 Mouth guard microphone pad & inner moulding kit consists of one (1) pad, one (1) foam cover & one (1) acoustic moulding inner. Includes instructions. 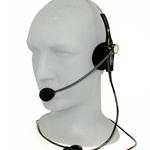 Lightweight (only 70 grams) single sided headset, noise canceling Electret microphone on a slim flexible boom. The headset terminates to a 3.5mm stereo plug. Lightweight (only 75 grams) single sided headset, noise canceling Dynamic microphone on a slim flexible boom. The headset terminates to a 3.5mm stereo plug. Lightweight (only 70 grams) single sided headset, noise canceling Dynamic microphone on a slim flexible boom. 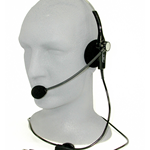 The headset terminates to a Nexus TP-120B plug. Rojone’s range of Noise Cancelling Communication Headsets is manufactured in Australia to meet the high demands of the harsh Australian environment. Built specifically to enhance two-way radio communication in high-noise environments our headsets are independently tested and can be customised to meet our customer’s unique requirements. Our range of headsets connects to all Industry and Military leading 2-way radios via a wired connection designed to fit most popular portable radios and mobile phones. 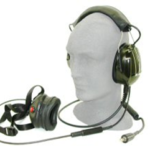 With a proven 15 year design, our headsets are well suited for the Oil, Gas, Mining and Aviation industries. 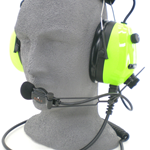 Headset for use in Commercial Aviation ramp & push back operations. 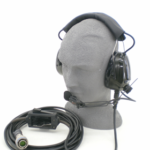 The headset comes standard with a leather headband, a military wire boom supports a noise canceling M87/AIC dynamic microphone inc. windsock plus a L.H.S. ear cup mounted volume control. The main cable is a 1.2 m part coiled lead terminating to a Switchcraft PJ-051 plug. 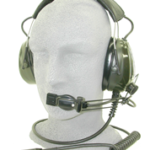 Headset for use in general aviation helicopters. The headset comes standard with a military wire boom that supports a noise canceling M87/AIC dynamic microphone inc. windsock plus a L.H.S. ear cup mounted volume control. The main cable is a 1.2 m part coiled lead terminating to a Nexus TP-102 plug. Headset for use in general aviation helicopters with a field replaceable microphone boom incorporating a noise canceling electret microphone and windsock plus a L.H.S. ear cup mounted volume control. The main cable is a 1.2 m part coiled lead terminating to a Nexus TP-120B plug. Headset for use in general aviation aircraft with a field replaceable microphone boom incorporating a noise canceling electret microphone and windsock plus a L.H.S. ear cup mounted volume control. The main cable is a 2 m "Y" split lead terminating to Mil Spec PJ-068 & PJ-055 plugs. 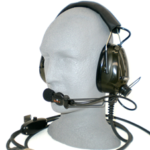 Headset for use in general aviation helicopters. 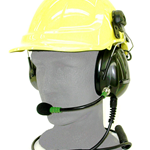 The headset mounts to a hard hat and includes a field replaceable microphone boom incorporating a noise canceling electret microphone and windsock plus a L.H.S. ear cup mounted volume control. The main cable is a 1.2 m part coiled lead terminating to a Nexus TP-120B plug. Rojone’s range of Noise Cancelling Communication Headsets is manufactured in Australia to meet the high demands of the harsh Australian environment. Built specifically to enhance two-way radio communication in high-noise environments. 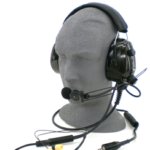 Our range of headsets is independently tested and certified at an SLC80 Rating of 31(Class 5). 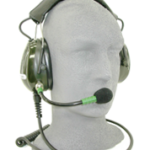 Our range of headsets connects to most Military 2-way radios and comunicaton circuuits via a wired connection. 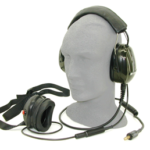 With a proven 15 year design, our headsets are well suited for the defence sector. Our range of headsets are already in service and meeting the current needs or the Royal Australian Navy, Army and Air Force. 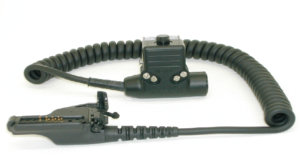 Black Noise headset for military use, with a field replaceable mic boom incorporating a noise cancelling electret microphone & windsock. The headset is wired as per AAP 7800.363 - 101 and windsock. The headset terminates to a Nexus TP-102 plug. For use with kyodo & Vase radios only. 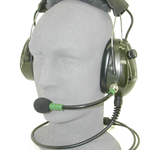 Black Noise headset for military use, with a field replaceable mic boom incorporating a noise cancelling electret microphone & windsock. The headset is wired as per AAP 7800.363 - 101 and windsock. The headset terminates to a Nexus TP-102 plug. 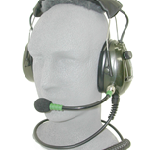 Black Noise headset for military F-111 flight Line use. 5 ohm Mouth Guard Microphone, 19 ohm H-143/AIC Earphones. Terminates to a Nexus TP-102 (U-93A/U). 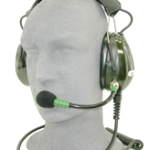 Black Noise headset for military Hawk 127 lif flight Line use. 300 ohm Mouth Guard Microphone, 300 ohm H-143 series Earphones. Terminates to a Plug 671 (UK Nato Plug). Black Noise headset for use on RAN Armidale Class Patrol Boats,150 ohm M87/AIC Microphone, 300 ohm H-143/AIC Type Earphones, MS-105 Mom in-line PTS switch & 1.7 mtr cable. Terminates to a MS27467T13F35P plug. Black Noise headset for use on RAN Armidale Class Patrol Boats,150 ohm M87/AIC Microphone, 300 ohm H-143/AIC Type Earphones, H-182 Mom/locking in-line PTS switch & 7.0 mtr cable. Terminates to a MS27467T13F35P plug.